Double Dip Mystery Bags each contain up to $100 worth of apparel; skirts, tops, corsets, dresses, jackets, etc. May be regular stock, discontinued styles, special purchases, etc. By doubling the value we can add wicked cool stuff like gowns, coats, stuff that retails for up to $100. No kidding! Please note; mystery bags are prepacked. There may or may not be overlap with a previously purchased bag. If you buy more than one -in the same order- we'll make them different. We can not honor requests like "don't send me any skirts" or "don't send me anything blue". It's a mystery! Size selections change with what we have available. If you do not see your size listed, check back often, as availability changes frequently! I got two dresses from this! both my style! I definitely love them!!!! I can't wait to show them off!!! 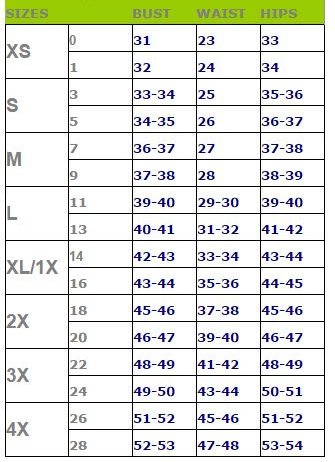 It's REALLY important to look at one of the sizing charts which can be found on any clothing on the site, or on the other apparel mystery bag. On this site I'm a 4xl but in reality I'm only an XL. I wish I could rate this higher, I really do, but there is just no way. I ordered a 2X mystery bag and got some crazy sizes. One shirt was a little big, the velvet green bodycon dress (which I'm sorry to say was hilariously hideous-but that isnt really anyones fault; ugly clothes were a possibility) was a perfect fit, and the black sparkly bodycon dress (which was actually nice to look at) was so small it was a perfect fit on my friend who is a size 10. I'm perplexed and disappointed and am extremely unlikely to order anything from the website again. An unexpected waste of money. Perfect for a fashion pick-me-up! I just received my first mystery bag, and now I’m a true believer! Not only do I have couple of darling little staples to wear, but a gorgeous, flattering dress that I’d never have thought to try on! If you’re looking for something to punch up your wardrobe, this is perfect! I received two skirts. Too small in the waist for me to wear, but that's my issue not GG's. They are adorable! Fun and a great deal! I received 2 amazing skirts in my bag. A long black fishtail skirt with pretty corestting on the back, and a ankle length grey skirt with a really nice black gothic pattern on it that had nice volume. For 30ish dollars this is definitely a great buy. My package came just in time and I couldn't be any happier. The gown I got was the one I was eyeing for the last couple of months and I am so happy that I got this. I will be getting another one next month.